Starbuzz Tobacco is known for the popular natural coconut charcoal. Now experience quick light perfection with the introduction of Starbuzz Coconut Instant Light Charcoal. Starbuzz Instant Light Coconut Charcoals are compressed into individual round tablets so they do not leave a lot of ash and to prevent the charcoal from rolling off the top of your hookah Bowl. Starbuzz Coconut Instant Light Coals are natural and offer instant gratification as there is no need to wait for these Starbuzz Coals to light. These charcoals are specifically designed for Hookah smoking, as they are odorless, tasteless, do not contain any chemicals, and burn three times longer than most other Charcoals on the market. 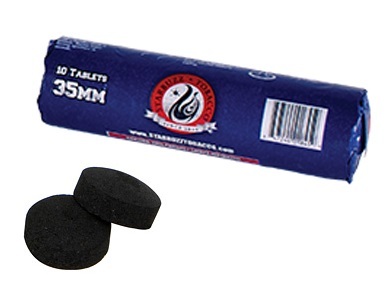 Each roll of Starbuzz Quick Light Coconut Charcoal contains ten individual charcoals.